I’m an admitted foodie - it’s true. Luke and I are more than likely to make a bucket list of restaurants and dishes as we are to making one of galleries, tourist sites and historic monuments. I could wax poetic about how important understanding a place’s rich history in culinary arts brings us closer to understanding its people, and although that is absolutely true, at the end of the day… good food speaks for itself. Good food brings people together, it opens dialogue, it makes life worth living. So why wouldn’t a traveler pick up an intense love for a place’s traditional foods? It taps into our innate sensory memory - those fleeting moments of intense recollection. Worldly flavors do so much more for me than fulfilling a meal. They bring back an indescribable element of nostalgia. They make me feel closer to those far off places. They send me reeling into deep fits of appreciation and gratitude. The truth is, guys, I use these worldly flavors most when I’m feeling an overwhelming sense of wanderlust. I feel most in touch with my memories of Italy when I’m cooking cacio e pepe and sipping wine. I feel closer to Japan when I’m slurping udon noodles and gyoza over a tasteless beer. These recollections come flooding back to me in the midst of savoring familiar flavors I’ve experienced on foreign lands. And even better, I feel more excited to explore unknown, unvisited places when I taste their dishes beforehand. Today, I wanted to share some of my favorite worldly flavors I discovered at Whole Foods, who so lovingly attended to my *need* for multicultural goodness, thanks to their new Lancaster store. Since their opening in late summer, Luke and I have gone to the store an embarrassing amount to peruse their aisles and get our fill of deliciousness. So, I’m thrilled to share some of my favorite finds. First up, a taste of Italy through an amazing “aperitivo” spread. If you haven’t caught on already, going for an aperitivo before dinner is one of my absolute favorite memories of our summers in Rome. If you ask my opinion, if you’re eating dinner in Italy without an aperitivo beforehand, you’re doing it wrong! Also - while we’re at it - can we please make these a real thing here in the states?! For our spread, I went for a classic chunk of Parmigiano-Reggiano (an Italian CLASSIC) fresh off the block, mixed with a delectable pairings of garlic marinated olives, parmesan and toasted crackers, and Mama’s Pesto (can’t recommend this stuff enough - it’s stupid good!). Is there anything more Italiano? I think not! What I love about Whole Foods is its insane cheese selection. Luke and I could have spent hours in there! We easily washed down all of this Italian deliciousness while sipping on Blood Orange Soda - something we were obsessed with when we lived in Rome. I haven’t been able to find anything that comes close to the stuff we loved so much until this one! To add a more multicultural twist on an aperitivo, why not make it a bit more French by adding some soft and pungent blue cheese, fig jam and a crusty, delicious baguette from the bakery… maybe with some sweet butter cookies for good measure? I also just had to pick up some dried lavender while in the store too. Is there anything more French than the smell of lavender? What I love about aperitivo is just how flexible it can be! Put out some pairings of cheeses, a spread, something crunchy, something fresh, something sweet - just GO FOR IT. And everyone’s happy! For my multicultural twist on a mid-afternoon tea, I paired a smattering of classic cookies and biscotti, with an Amsterdam favorite, stroopwaffles, and a pour-over of Lancaster Coffee Roasters. Seriously the coziest spread! Get this girl some cookies, coffee and a good book and she’s square. While we’re on the sweet stuff - I picked up a few multicultural chocolate bars while shopping at Whole Foods! Check these babies out! 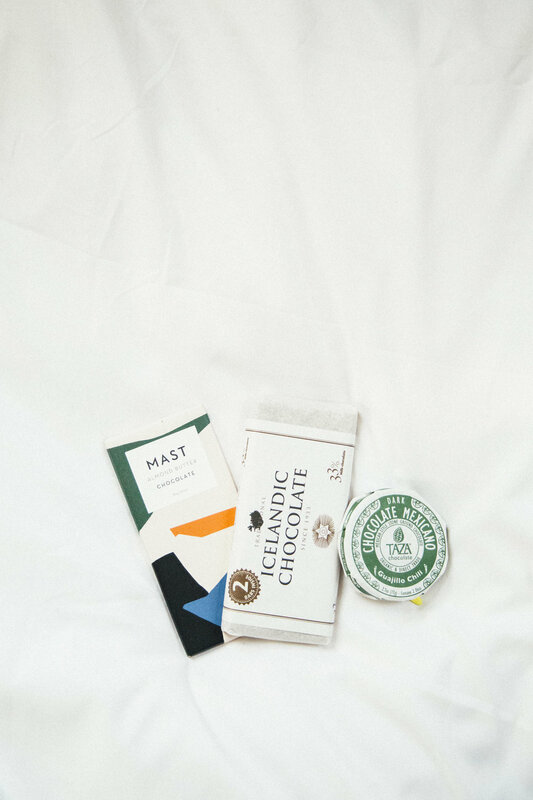 Mast Chocolate Bars in Almond Butter, right here from Pennsylvania, an Icelandic Milk Chocolate Bar, and a Guajillo Chili Chocolate Bar from Mexico. Just proof that all around the world, people celebrate the deliciousness of chocolate in their own beautiful ways. I’m just here spreading the good word… a relishing in their creations! While we giddily shopped Whole Foods aisles, I had to pick up some other worldly flavors I miss ever so much, like the matcha latte powder, some thick cut udon noodles straight from Japan (taking me back to Shinjuku’s Omoide Yokochō!) , as well as some other Asian treats like Whole Food’s Jalfrezi Curry Simmer Sauce (love this stuff) and Kalbi Sauce from Korea. It’s amazing how much selection Whole Foods has. Any sort of multicultural dish could definitely be covered - a big perk here in Lancaster, where a lot of grocery stores lack those unique ingredients needed in traditional meals around the world! Using cooking as a tool to “deal” with my wanderlust while at home has served Luke and I well. We’re not only well fed, but also hellbent on developing our perfect recipes to make here at home (or at least until we can taste the real deal in person). We feel connected to our memories of those far off places and also filled with curiosity for those we taste often but have yet to step foot in. A big thank you to Whole Foods for sponsoring this post. Feeling so grateful to have a store here in Lancaster to consistently shop at! Have you ever used cooking as a means to “deal” with wanderlust? What are your favorite recipes and flavors?